Back at Duke, & Food. So a month has passed since I last posted – where I also promised that I would be posting the final two entries in the “next few days.” Oops. A month has passed and all of us are now back at Duke. We see each other around campus (a lot!) and wave hi. Mark and Emily creepily sit behind me and to my right in my Politics & Literature class (haha I joke about the creepiness but it is nice seeing their faces on Mondays and Wednesdays). Emily, Ryann, and I are all in the same Enviro 101 class. Polly is my roommate. Polly, Ryann, and Emily take very age-appropriate and pro-vegan pictures at Tailgate (hehe). Brad and I continue to talk about Asians and you can spot him walking around the main quad in his Ray Bans and inappropriately colored shorts (:P). John sends us daily digests way too often (does this kid do work?) and plans awesome weekly True Blood viewings. He also helped me lock my bike once, after he locked his own bike and noticed a confused girl (me) trying to shove her recently rented DukeBike into the racks at Sanford. Harrison hides in a lab doing research and walks around with his nalgene (as do I!). He’s also the mountain bike trip coordinator for Outing Club; I totally didn’t sign-up for the Outing Club’s listserv and creep on him… I also met Mark’s roommate at the Link one day. I am back to being a meat eater. However, I do eat way less meat. It’s true. Sometimes, I just want a salad. AHHHHH. But honestly, yes, Ting-Ting is eating less animals. Ryann has also gone back to being vegetarian (mostly) as have some of the rest of us too. Not everyone though.. not everyone :]. Our Environ 101 professor was actually talking about that today and she mentioned how she is vegetarian 1/7 of the week (on Mondays) and that there are 6 other people in this pact, so together, they make one vegetarian. Huh. But more about Portland food. Their cuisine is truly “localvore” and everything’s always super fresh and mostly healthy. There’s also a TON of vegetarian and vegan restaurants, not to mention restaurants that are super friendly to the plant-eaters. You no longer have to think about what to avoid and where will be most appetizing. A lot of places are pretty expensive though. At one end of the spectrum, you have the foodcarts where a very fulfilling lunch (plus some) will only be about $5, $7 max. At the other end of the spectrum, Portland has some very fancy shmancy restaurants where entrees run in the $20-30 range. There’s also tons of cultural restaurants – we tried an Ethiopian place and several Thai places, but there’s also Lebanese and many many more. I never did find the bibimbop lady though.. she was supposed to be the owner of one awesome traveling foodcart. So what have been the responses I received from friends/peers afterward? Let’s start with the DukeEngage Academy, where everything was vegetarian. The reactions were basically all along the lines of: “OMG WHAT WAS WRONG WITH THE FOOD. THERE WAS NO MEAT! I HAD TO MAKE A CHIK-FIL-A RUN.” When I told them that was because of our program, people just rolled their eyes. Other people believe I’m still vegetarian or loudly ask me what is wrong with me. Vegetarians laugh as I talk about how I attempted to be vegetarian for breakfast and lunch but had to succumb once dinner came around. Other people talk about how “easy” it is. Now that I’ve experienced it a little, I can definitely see that perspective. We’ve all been home from Portland for a week now. I’ve been catching up on sleep, reading a lot, hanging out with friends back home (as we’re all finishing up with internships & research projects), DRIVING (whoa! ), and preparing to go back to Duke (read: buying textbooks and packing). However, I realized I’d forgotten to wrap up this blog and our amazing summer in a really cool city in the Pacific Northwest. So onto the first of three. 1. Not everyone likes Portland. Yes, they’re doing well for themselves, but that doesn’t mean other areas in Oregon want to be like them. Although they do wish they had certain amenities that Portland enjoys – its more extensive TriMet service and streetcars to name a few – even nearby neighborhoods like those in Washington County do not want to be “Portland-ized”. Portland is oft referred to as “The Republic of Portland.” Tread carefully. 2. An organization’s stance on one issue. Sometimes they may have a strong stance for or against, but most of the time, they do not have a specific position. When that happens, we interns must figure out how to address it appropriately in a public setting when representing our organizations. 3. Confidentiality. A lot of campaigns aren’t public. Legislative agendas are being finalized and content can’t be as easily shared as the click of the Send button in your outgoing e-mail. Some reports aren’t published yet and are for internal use only. Sometimes they have so much lingo we interns are lost and in a daze, mumbling about emissions and silver butterflies… stealthily and in our heads of course ;]. 5. Policy vs. Project: Do you start the project first and then write policy that allows that to happen? Or do you get together with a committee and start formulating policy, only then to realize that the other team’s project visions do not “fit” your policies? Is it possible to construct them both together and then have everything come together like jigsaw puzzle pieces or is it inevitable that they will clash together like crumbling bits of cookies as we collide them together? Don’t ask me. 6. What are we actually accomplishing? How effective is our work? That frustration that starts to seep in right around 2:30 every afternoon after the recent reviving from a food coma. Is there a need for an unpaid intern, aka me? Are my supervisors spending more of their time coming up with ways to explain projects to keep me occupied when they could’ve just done it themselves, faster, better? The answers: more than we can imagine; uncertain; yes; no. This goes for our volunteer projects as well. 8. Clarity. Make sure you ask a LOT of questions! And then keep in mind that you might not necessarily get answers. 9. Time. Many of us finally began understanding our organizations and what exactly it is that they do toward the end of our time there. Then, all of our projects started to make more sense. And we didn’t even have barriers like language (save jargon) or cultural things (actually scratch that haha). It’s also summerTIME – which means a lot of non-profits are in a waiting period where they finalize things and kinda twiddle their thumbs (not really though, everyone’s still really busy) as compared to when legislative periods roll around and they can do more damage. A lot of people have strange hours and it’s hard to reach people via phone/e-mail/in person! 10. Communication!!!!! Or MIS-communication I should say. To be honest, these weren’t necessarily obstacles to engagement – they were all part of our engagement, as we learned more about our environments, in every sense of the word, and more about our own skills and qualities. It was very humbling, confusing, and rewarding all at once. And in the end, we found solutions – or at least tried – for all these problems, with the help of all the cool people we met. I really can’t understate the power of people and their willingness to help you, a dizzy intern in a strangely fantastic city. Ting-Ting has been asking me all summer to write a blog post, but I’ve been hesitant to do it because writing a blog post naturally entails being inside at a computer, which is no fun at all. But since I’ve pretty much finished up all of my vegetation monitoring for the summer and am stuck inside on a computer anyways, figured I’d give it a go. My work this summer has been somewhat different from everyone else’s, in that instead of working in an office on policy and administrative issues, I’ve been out in the field doing more hands on monitoring. I’ve been working for SOLV, an Oregon non-profit dedicated (amongst many, many other things– check out their website! solv.org) to invasive species removal and watershed health. 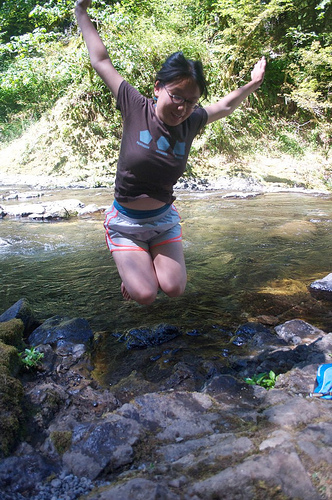 SOLV has 77 creek and wetland restoration sites distributed all around the portland metro area and beyond. Most were at some point or another variously disturbed by some assortment of human activity (urban development, logging, agriculture) and now are overrun with invasive species like reed canary grass, himalayan blackberry, morning glory, and many others, and are generally unhealthy, poorly functioning, and poor habitat for native wildlife. SOLV has come in and, through partnerships with private and public landowners and tremendous volunteer support, attempted to restore these sites to their original, forested, native dominated, healthy, beautiful, environmentally productive glory. As an infinitesimally small part of that effort, I’ve been helping to do vegetation monitoring on the sites this summer. Vegetation monitoring basically involves visiting each of the sites, checking for invasive species, and measuring and identifying the plants in predetermined monitoring plots randomly spaced on the site to get a general idea of site health and plant coverage. It’s been an awesome job (even if it involves a ton of driving and a pretty high carbon footprint). Being out in the field has been great, and getting to see creek and wetland sites in various stages of restoration and states of health has really been eye opening. There’s a world of difference between an unhealthy site– a muddy stream surrounded by a wasteland of reed canary grass and blackberry– and a healthy one, filled with vibrant native plants and wildlife, forested or shaded, with a creek running cool and clear. It’s really incredible the work that SOLV is doing, and great to be a part of that effort, if only for eight short weeks. 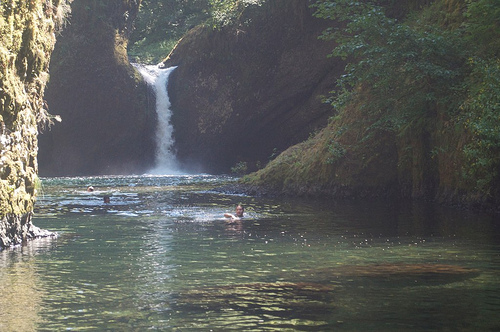 My weekends this summer have also been somewhat more nature-oriented– apart from all the other awesome trips our group has been taking, I’ve been getting out with a Meetup hiking group to do a few extra trips of my own. Meetup has been great (allows people with similar interests to meetup and carpool to do all sorts of interesting things). 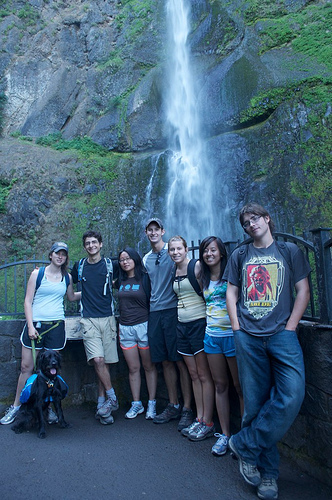 I’ve met a lot of great Portlanders on the trips, and so far I’ve done hikes with them at Larch mountain (a neat extinct volcano at the edge of the Columbia river gorge, with misty hemlock and fir forest and incredible views at the top), Salmon butte (near Mt. Hood, more misty old growth forest and incredible views of all sorts of mountains from the top… shrouded in clouds on the day I did it), and I’ll be doing a hike at sheep canyon near mt. St. Helens this saturday just before we leave. Apart from the meetup hikes, I’ve also been exploring Hoyt arboretum and forest park with Mark and hiking in the gorge at Angels rest with Kellyn and Abe. It’s been great– I’ve seen more waterfalls, snow capped mountains, creeks, forest, and moss than I’ve seen in my entire life up to now. Oregon is really an incredibly beautiful, interesting place, and I definitely hope I’ll be able to come back someday to explore it more. 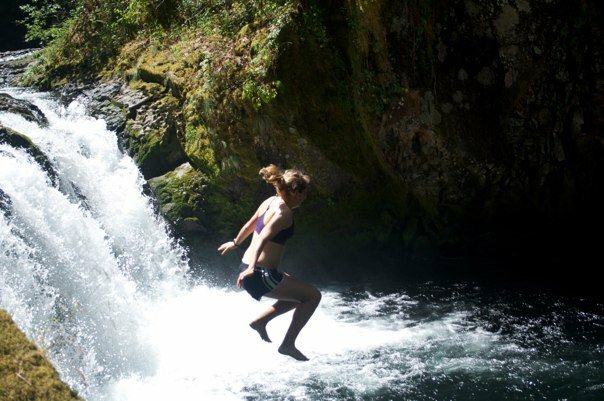 On the whole– exciting field work, awesome hiking, good times, cool people– it’s really been an incredible summer… Dukeengage Portland is awesome! Portland is full of surprises. Our past 7 weeks have been full of surprises. The good, the bad, the smelly, the hipster, the awesome, and the weird. It is these surprises – whether they are events, people, a comment, something shiny in a window, a large sign, a food cart – that make me smile and absolutely love Portland and this strange wondrous city. Sometimes these surprises are irritating though. And I find myself confused or in question, but it’s all part of this diverse array of personalities and “things” of this truly vibrant city. I was so scared before DukeEngage. I thought Portland was going to be so “hippie” – that everyone everywhere was constantly going to be smoking pot, drinking beer or pale ale, wearing clothing made out of coffee bean bags, hemp bracelets, that the Greenpeace people were going to find me in my sleep. While I have seen (& smelled) these things, albeit on a smaller scale, there’s so much more to Portland I didn’t realize. First, there’s a Morgan Stanley and a large Bank of America building very close to where I work. Yes, there’s wealthy people here. Yes, there are investment bankers. When I get lunch at the food carts, not only do I see people who work at non-profits dressed fairly casually, but I also see businessmen and women dressed to the t’s. There’s also a Nordstrom’s and a MALL. There’s civilization! What?! Yep. I was (am?) definitely an ignorant child from the East Coast with my snooty East Coast education. But besides this, Portland has stores and people who are SO UNIQUE to Portland. First, I went to the Portland Outdoor Store just the other day during my lunch break. There were shelves upon shelves of real authentic cowboy boots (price range >$180 sigh), cowboy hats, tacks, saddles, bridles, plaid flannel shirts, belt buckles, sheepskin outerwear, all sorts of things horse-related. There were also old men dressed in plaid flannel shirts, worn jeans, cowboy boots, and bandanas. They talked to me and asked me if I was looking for anything particular. I was just overwhelmed really. And I kept thinking that Mark needed to come here haha. A few doors down, there was a small front that said “Exotic Dancers. Only 18 and Over May Enter.” I giggled and walked back to my office building. After work yesterday, I went to Magpie, a vintage store, and got navy blue paisley suspenders. Whattt? That’s right. Then there was this cellist at lunch today on the intersection of SW 9th and Alder. Brad, Ryann, Polly, John, and I all met up for lunch at the famous foodcarts there and we sat down at the tables next to Spella Café – where I finally found a good local Chai Latte! – where the cellist was playing an all too familiar tune. There was also the guy from the Bus Project who we met at the Crystal Ballroom asking us to register to vote. Too bad we don’t live in Oregon. But I took a picture with him – he was wearing a light blue short-sleeve dress shirt, a neck kerchief (! ), suspenders, denim Bermudas, and carrying a brown satchel. What a cool confident kid. He was a native Portlander as well. It’s places like these that I will miss when I go home to New Jersey and when I’m back at Duke in Durham. Yes, those places do have their “local” charm and certain specialty stores but not in the way Portland does. This “small” city certainly has a large personality but such an understated way of delivering that personality. It’s refreshing. 7. Flicks on the Bricks – the hugebutt inflatable (that’s what it looked like anyway) movie projector screen in pioneer square. tons of people were there. 8. Rose gardens – not just the international test garden but other smaller ones around the area. 9. 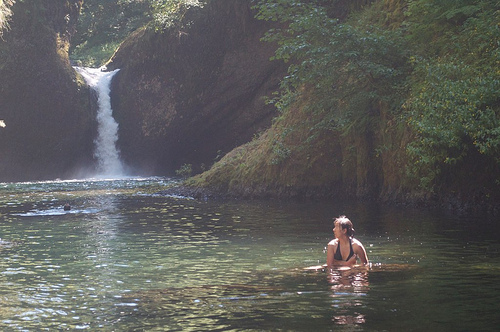 FOUNTAINS, WATER, everywhere – one reason why the rest of Oregon is not a fan of Portland. 10. Tattoos and gauged earrings. 11. “Thursdays” – speaking of that, I’m off to Alberta Street for Last Thursdays! Catch y’all on the flippity flip. So on Sunday, we saw a lot of waterfalls. 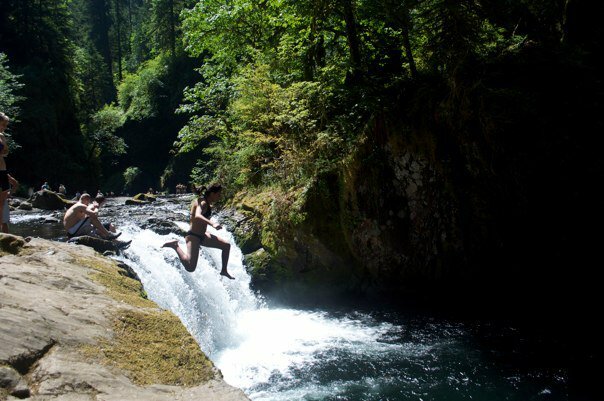 Then, we saw some people jumping off the waterfalls – not really directly off the waterfalls, more like on cliff ledges near the top of the water falls – into the “swimming holes” the waterfalls would end in. And we knew we had to do the same. 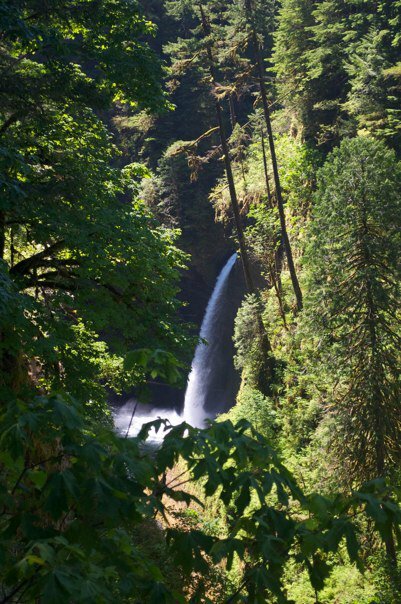 This waterfall we went to was about 2.5 miles in to a hike called Eagle Creek. The hike was kinda precarious. 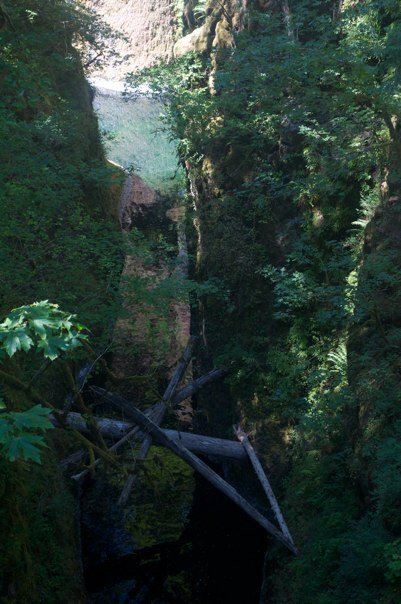 There were parts where if you took one misstep, you would’ve had a straight shot down into the depths of the Columbia River Gorge. But it was beautiful and completely worth the walking. While we were at that same waterfall jumping area (we stayed there for a few hours), Brad and I decided to go into the water at this other swimming hole area nearby, connected to the first waterfall by a running stream (my descriptions are great…), and see if we could swim out to the second waterfall. The water was ridiculously cold, but we just stood there and got numb. 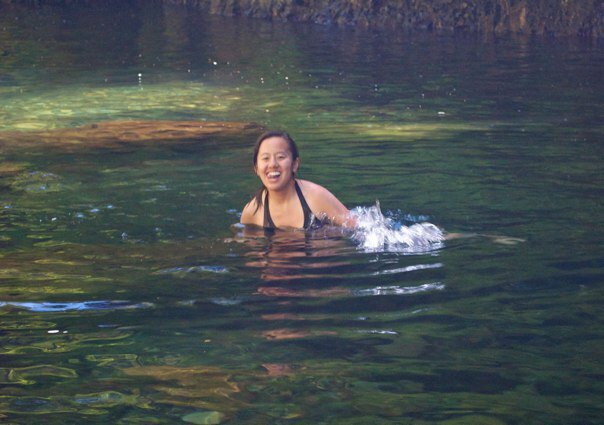 And then swam out to some rocks, shivering but enjoying the sunshine and smooth rocks below – the water was SO CLEAR! After a few minutes, we decided to just go for it as Brad swam off first into the cold cold cold cold dark water. I followed and my body felt so cold it was warm (…yeah, about that) lol but then there was a grassy hill area where we climbed onto right before the larger pool of water that the waterfall was rushing into. There are no pictures of this place because you couldn’t see it from the main rocky area. And we couldn’t see all the masses of people who had come – there were countless groups of friends and families there toward the end of our stay at the waterfall area – we could only see the rushing waterfall and the people who were jumping off a REALLY HIGH cliff ledge to the left of the waterfall. It was sunny and warm. After being able to breathe normally again, we jumped into the water from off the grassy hill and swam back to the rocky shore. 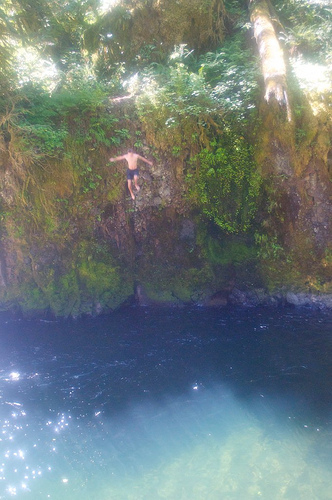 Back at the shore, Emily was flying, Ryann was putting on sunscreen, Kellyn and Abe were chilling, and Mark was still gushing over his jump from the cliff. John, of course, was documenting all of this behind his camera. 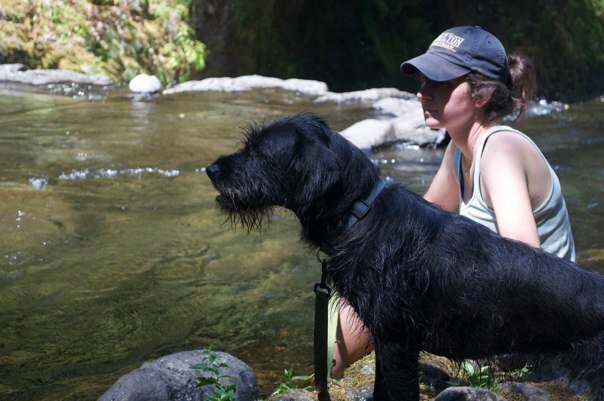 Before heading back to PSU, we went to Sandy River Delta, a sandy river (I’m just full of great descriptions today hehe) that was open to dogs and humans alike. Abe was having a ball and we loved being in WARM water. There was a current though and I definitely got carried away sometimes (my puns are also endless). 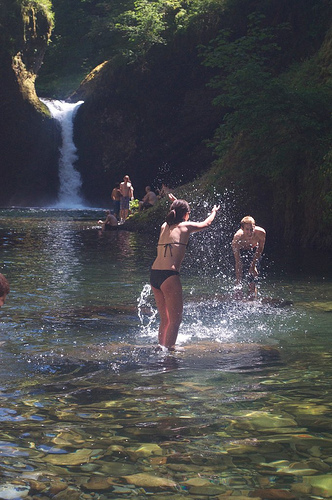 We had fun doing group “trust falls” and being thrown into the water. Emily is also slowly learning to swim yay! One more weekend of traveling together We’ll be going to Bend, Oregon to stay at Ryann’s house and go hiking at Smith Rock! Our weekends are always so bipolar. So on Saturday, we saw a lot of trash. We went to METRO’s Waste Transfer Station early in the morning for our second to last volunteer project (!). We took a bus to get there but then would have to walk another mile before we reached the actual site. That mile went through industrial wasteland so we held our noses and played logic games (There’s a guy in a room with 53 bicycles. He’s dead. How? ), commenting on this “other” part of Portland that reminded us of New Jersey (sigh) with its expanses of barbed wire, glass strewn all over the sidewalk, and bleak factories and warehouses as far as the eye could see. 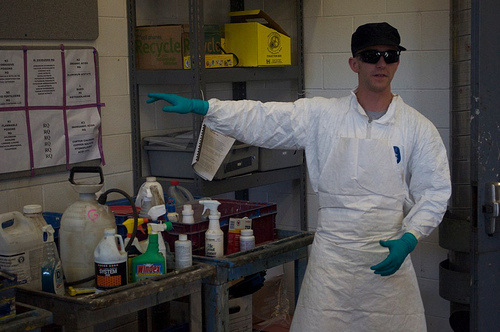 We were given a tour of the entire building and also of the hazardous waste area. Let’s just say the smell was really intense. But we also learned a lot of cool things – about how people will come to their facilities, weigh their car, dump all their trash, weigh their car on the way out, pay, and repeat, often. 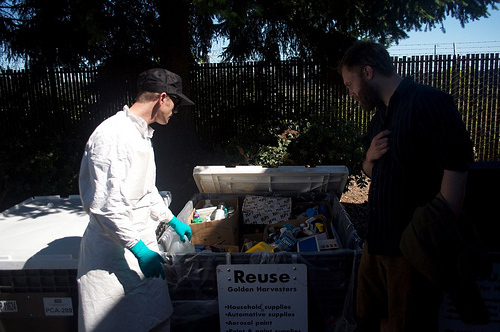 Also that a lot of people (me including) definitely don’t know how to separate their hazardous materials, but there are kind people at the Waste Transfer Station who do know how to. They also donate unopened or barely used products to organizations like Habitat for Humanity and the Golden Harvesters (low-income families can pay about $5/month to pick up a box of various products like cleaning supplies and paint). The Waste Station also really tries to recycle and reuse as much as possible. They actually go through the trash and then are able to recycle about 90% of all the cardboard and paper they find. They also had these different sections where they piled plastic, glass, nature’s debris, etc. It was all really organized and pretty neat. One of us asked an interesting question about if the Waste Station ever tries to start any programs to educate the people on how to separate their own trash (recycling, hazardous, nonhazardous, etc) so that the Waste Station doesn’t have to separate it all. Our tour guide had a very reluctant, helpless look on his face as he described how people would just come there, drop off all their stuff in one big pile, have the workers walk over and explain to them how they could put certain metals in certain areas and other materials in another place and how doing some of those things could save them a lot of money, and then have those people ignore them completely. You can’t force people to do something they don’t want to do, to do something they’re not required by law to do, was his gist. The rest of the day, we all split off. Emily and I went to the Saturday Market and did some very productive gift shopping and then we met up with Mark, Polly, and Kellyn at OMSI (Oregon Museum of Science and Industry)! It was fun and kind of small but I have high standards from science museums on the East Coast that serve much larger populations than OMSI does. The brain teasers were awesome though. We’re still pondering some of them to this day.